This is my first attempt at creating a proper scale model for 3D printing. In this case I am creating a weigh building in G-Scale. This has been a huge learning curve. I've since learned from some of the issues in the first model and so part 2 will improve on the techniques shown. The 3D printed version is approximately in G-Scale (1:22.5 scale). This is also known as garden gauge railway, designed for narrow gauge trains running on 45mm track. It may also work well with 16mm model railways as the size is perhaps a little smaller than G-scale. 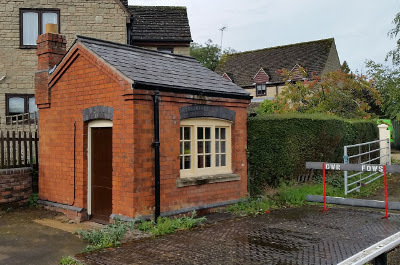 The main difference between the real building and the scale model is that the model does not use the different coloured brick that is in a curved shape above the window and where the side walls meet the roof. The main reason for this is the time it would take for a feature that I expect few would actually notice if I hadn't pointed it out. One of the challenges was in finding an appropriate colour PLA to give a good brick effect. The problem with most suppliers is that the closest the provide is either red which tends to be a bright post box red colour, or brown which is too dark. 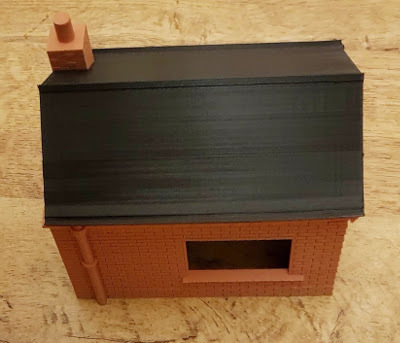 I had tried experimenting with different colours with acrylic paint when creating a brick wall previously, but then I came across a brick effect PLA filament from Filo Alfa. I couldn't find a UK supplier for the FiloAlfa PLA so I ordered it direct from the manufacturer in Italy. Unfortunately whilst the cost of the PLA is quite reasonable, the additional cost of shipping meant it was in fact very expensive. I am however very happy with the quality of the PLA which works very well in my Wanhao 3D printer.